At the edge of the world, the Doctor discovers there’s another planet in our solar system and it contains a threat that could wipe out humanity. Well, it took about two years after my initial plan but here we are: the last William Hartnell/First Doctor episode. I’m not sure how I feel about this. I’ve loved watching these First Doctor episodes and I’m sad to see them finished but I’m also looking forward to the Patrick Troughton episodes. The Steven episodes prepared me for this moment as I’ve been eager for something new for quite some time. I’m just sad that I won’t have a larger amount of time with Polly and Ben with the First Doctor. I really enjoyed their interactions. Besides being the final William Hartnell episode, this was the first introduction to the Cybermen. Their backstory is that they were originally humans on a twin planet called Mondas. In order to survive, these humans began to add cybernetics to their bodies, slowly destroying their humanity by eliminating their emotions and empathy. In Modern Who, their backstory comes from a parallel universe instead. These original Cybermen have a complex costume, with wires and tubes attached to the front of their bodies. I found them to be gruesome and frightening as it is obvious that these are creatures willing to do whatever it takes to survive. Should one compare the costumes from the original design to the upgrade in Modern Who? I don’t believe so as they are both a product of their time. Both are creatures to be feared as they are both powerful with their single-mindedness to control the world and eliminate weakness. Having been a fan of the Cybermen since I’ve watched them on Modern Who, I was excited to see their first appearance. 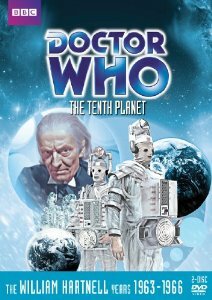 The Tenth Planet did not disappoint and I was on edge after the first installment. The suspense that was created with the first appearance of the Cyberman lingered throughout and was handled quite well by the actors and the special effects team. The final installment is missing and was recreated through animation with the remaining audio soundtrack. Kudus to the animation team that created and maintained great suspense throughout the presentation. The entire episode was well-done even with the lack of William Hartnell as he was ill in the second and third installments. Michael Craze, who played Ben, took many of the lines intended for the Doctor, with the scientific lines given to the character called Barclay, who was the Chief Scientist in the episode. I will miss the First Doctor but it’s time to move on. I am grateful for what Hartnell created and it is because of his legacy in those first seasons that we have Doctor Who still today. This was the last episode of the First Doctor and the first time that a regeneration was shown.